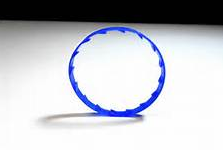 I am grateful for the plastic ring that results as you open a gallon jug of milk. It wasn’t always this way. I used to get irritated with my husband for leaving the “milk ring” on the kitchen counter. Why couldn’t he just turn around and throw it in the trash? Is that so difficult? I personalized this to the ridiculous extreme. I felt disrespected because he would carelessly leave this trash behind in my path for me to clean up. What was he thinking? Well, at first he wasn’t. He had no evil intent. Instead of using my powers for good, I used them to turn a harmless little action into a personal attack. I had the amazing power to turn what should have been an insignificant event into a heaping helping of negative feelings. Once my husband learned about my ridiculousness, he began to teach me a lesson about life. He began to leave the milk ring on the counter on purpose. Sometimes he even puts them in my purse or in the pocket of my jacket for me to find unexpectedly. Through my ability to stop taking this thing so seriously, and through his gentle and constant reminders, the milk ring has become a symbol of love, acknowledgement and humor. Now, when I find a milk ring on the counter, it makes always makes me smile. It reminds me of the lovely journey we are taking together. It reminds me to laugh at myself when I am taking things too personally. It reminds me that my husband is thinking about me, and that he loves me even when I’m being crazy.